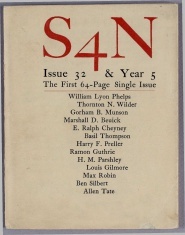 S4N was a magazine published in Northampton, Mass., in 33 numbers between 1919 and 1925. 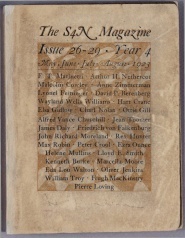 In its earliest stages, editor-in-chief Norman Fitts described the magazine as a "discussion of the arts in a monthly magazine". It published contemporary poetry and stories, as well as essays discussing modernist tendencies in art and music. 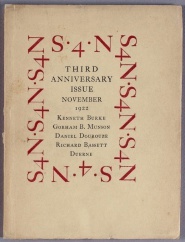 Among the notable poets, writers and literary theorists that were published in the magazine were E.E. Cummings, Hart Crane, Kenneth Burke, and Malcolm Cowley. 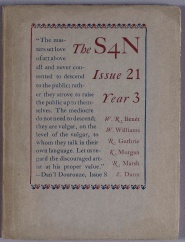 S4N 21 (1922). PDF, PDF (25 mb). S4N 22 (Nov 1922). PDF, PDF (21 mb). 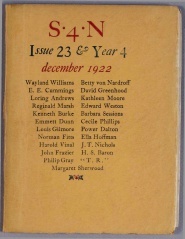 S4N 23 (Dec 1922). PDF, PDF (16 mb). 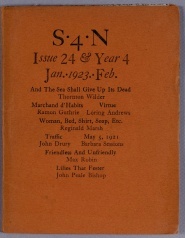 S4N 24 (Jan-Feb 1923). PDF, PDF (18 mb). 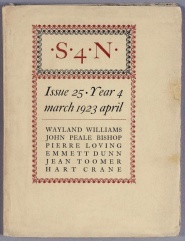 S4N 25 (Mar-Apr 1923). PDF, PDF (16 mb). S4N 26-29 (May-Aug 1923). PDF, PDF (51 mb). S4N 32 (Feb 1924). PDF, PDF (19 mb). The above PDFs are sourced and linked from Bibliothèque Kandinsky. This page was last modified on 13 May 2017, at 10:02.